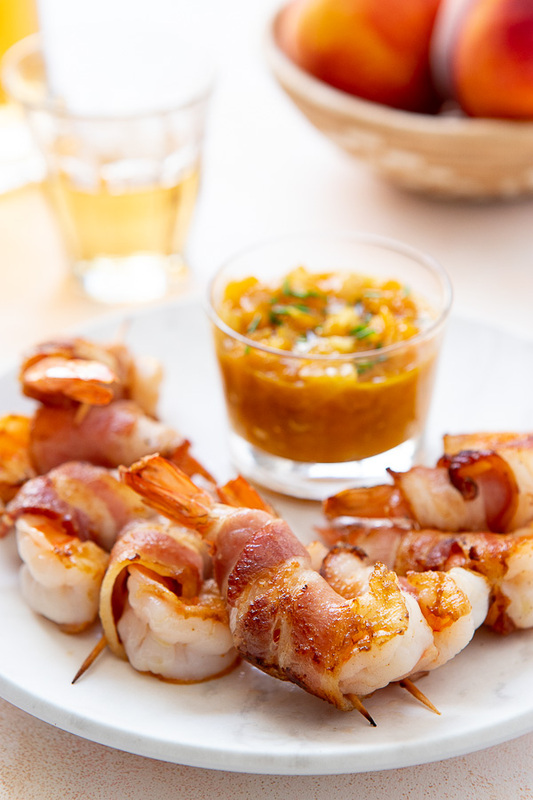 Bacon Wrapped Shrimp with Whiskey Peach Chutney might just be the perfect shrimp appetizer! Sweet, salty and a little smoky, this shrimp recipe is all about juicy shrimp!! Learn how to make the juiciest shrimp with my easy tips!!! Ever notice the what appetizers go like lightning at a party? Yup, shrimp appetizers!! Gambas Al Ajillo (shrimp in garlic sauce), Scampi Shrimp Toast and Roasted Shrimp with Creamy Citrus Aioli.. and these Bacon Wrapped Shrimp with Whiskey Peach Chutney are always the first appetizers to go at my parties! This bacon wrapped shrimp recipe is easier to make than you would think – especially with my tips! You can assemble this shrimp appetizer hours ahead of time and then just pop them into the oven about 15 minutes before you devour serve them. Easy peasy! Follow these three easy tips for the best bacon wrapped shrimp! Use larger shrimp – anything from 15 to 25 count (that’s number of shrimp per pound). Larger shrimp will take longer to cook and won’t be overdone by the time the bacon is cooked! Don’t use thick sliced bacon! Thicker bacon takes longer to cook so you risk overcooking the shrimp! Whether you are roasting, grilling or baking your shrimp, the “secret” to plump and juicy shrimp is…brining!! Yes, brining! A short “dip” in a salt and sugar brine makes ALL the difference between dried out, tough shrimp and luscious, juicy and tender shrimp. It is so easy and so worth the extra step! Stir the salt and sugar into the water to dissolve. Add the shrimp and then the ice and let sit for 15 to 30 minutes. 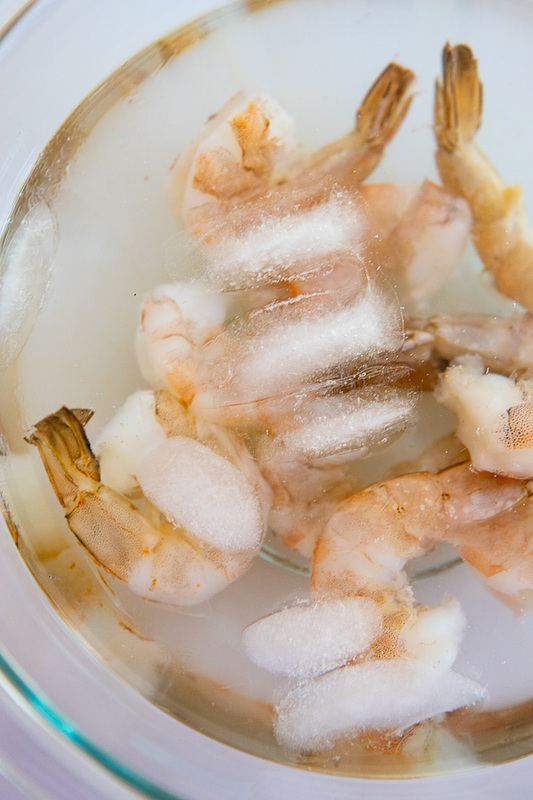 Remove from the brine, blot the shrimp dry and proceed with your recipe! Warning: don’t brine the shrimp for more than 30 minutes – otherwise you’ll have mushy shrimp ☹️! Bacon wrapped shrimp is definitely common appetizer (23 million listings on google!) 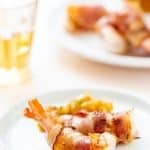 but what sets this bacon wrapped shrimp recipe apart is the whiskey peach chutney! This chutney is a snap to make, especially if you follow my little tutorial on the most dreaded part of this recipe… peeling peaches! Hate peeling peaches? Me too! I always ended up with lots of the flesh stuck to the skin until I learned the best way to peel and slice peaches! 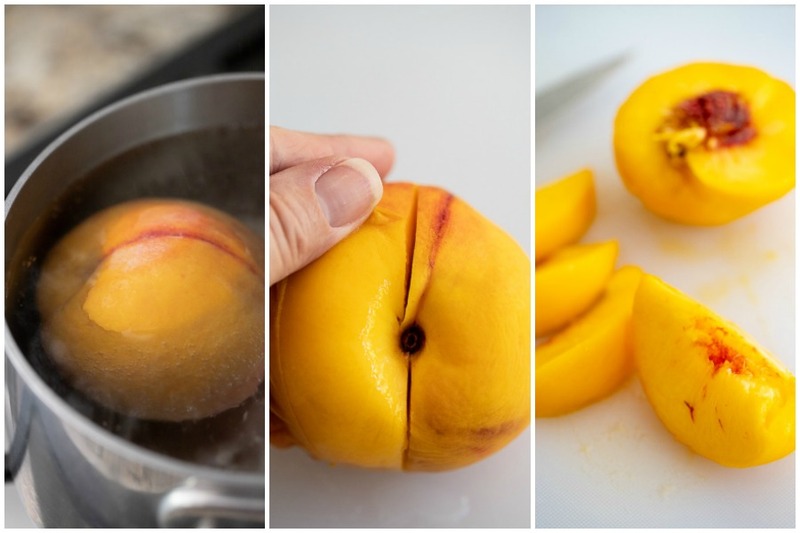 So here is the best way to peel and slice peaches! Place the peaches in for about 60 seconds. Remove the peaches and place in a bowl of ice water. After the peaches have cooled in the water for a minute or two, remove them. The skin will slip right off! Cut the peaches lengthwise, pressing the knife blade against the pit and then wiggle to separate the halves. Flip the peach half onto the cut side and slice! Step #1: Pre heat the oven to 400 degrees. Cook the bacon in a saute pan for 3 – 5 minutes to cook off some of the fat so that when you cook the bacon wrapped shrimp, the bacon and shrimp cook in the same amount of time. Step #2: Pour off some of the bacon fat from the skillet and add the onions. Cook until the onions become translucent and then add the chopped peaches and cook for another 5 minutes. Then add the whiskey! Step #4: While the chutney is cooking, remove the shrimp from the brine and blot dry. 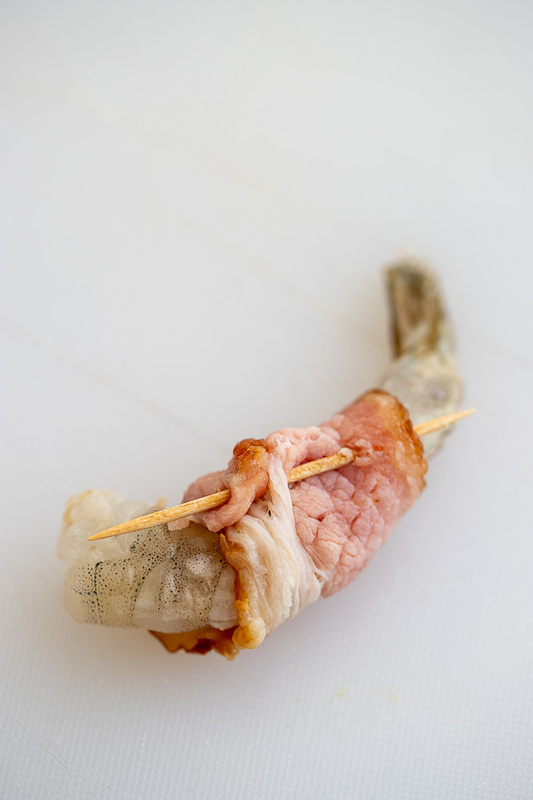 Wrap the bacon around the shrimp and thread a soaked toothpick through the bacon to secure it to the shrimp! Step #5: Place the bacon wrapped shrimp on a rack set over a foil lined rimmed baking sheet. Cook for 10 – 12 minutes until the shrimp are cooked through and the bacon is just becoming crispy. Serve with the whiskey peach chutney!! Perfect for BBQ’s , parties, or as part of a “small plates” meal! Make an extra batch of the Whiskey Peach Chutney and serve with grilled, roasted or baked pork chops, tenderloin or loin roasts! If you enjoyed this recipe I would love if you would rate it and leave me a comment below!!! 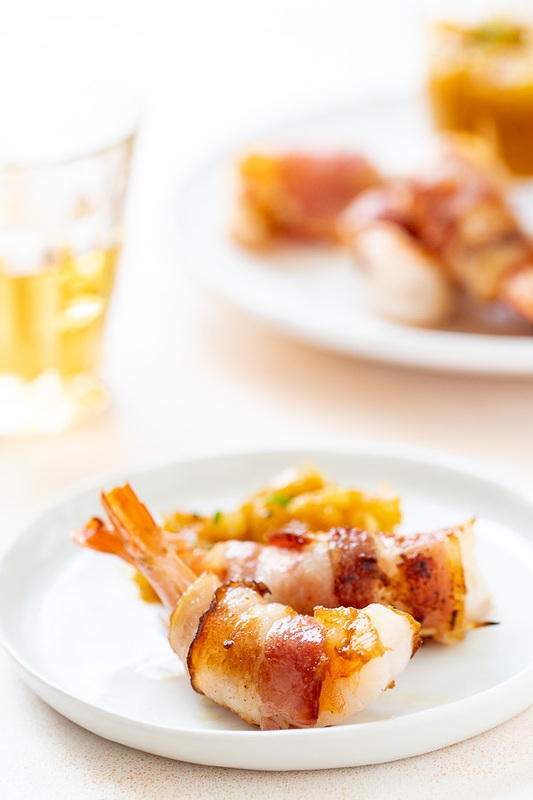 Bacon Wrapped Shrimp with Whiskey Peach Chutney might just be the perfect shrimp appetizer! Sweet, salty and smokey with the juiciest shrimp ever using my easy tips! Combine the water, salt and sugar in a large bowl. Stir to dissolve the salt and sugar. Add the shrimp and the ice cubes. Brine for 15 to 30 minutes maximum. Remove shrimp from the brine and pat dry. Pre heat the oven to 400 degrees. Soak toothpicks (one for each shrimp) in water and set aside. Slice each bacon strip in half so that you have 1 piece of bacon for each shrimp. In a large saute pan, cook the bacon over medium high heat for 3 - 4 minutes until the bacon has rendered some of its fat and the bacon is starting to brown at the edges but is still pliable. 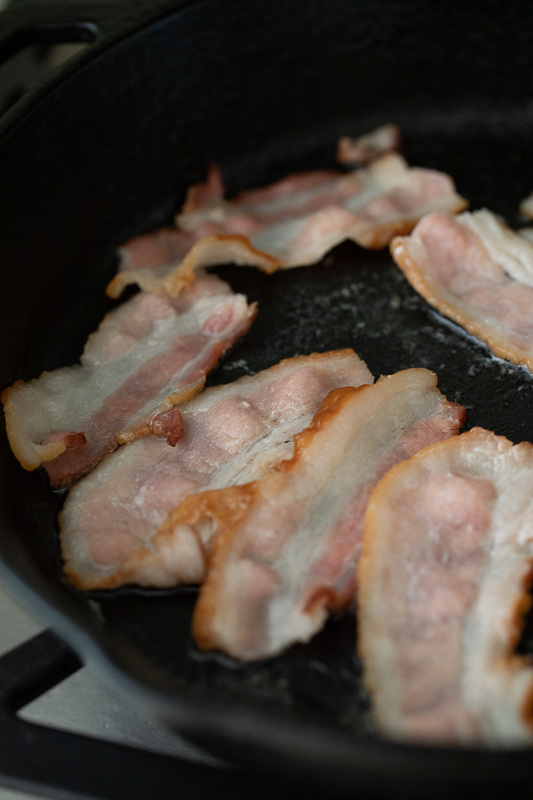 Remove the bacon from the saute pan and drain on a paper towel. To wrap the bacon strip around the shrimp: starting near the tail, wrap the bacon around the shrimp and secure with one of the soaked toothpicks. Place the shrimp on a baking rack set over a foil lined sheet pan. Roast for 10 - 12 minutes or until the shrimp are opaque and the bacon has crisped. 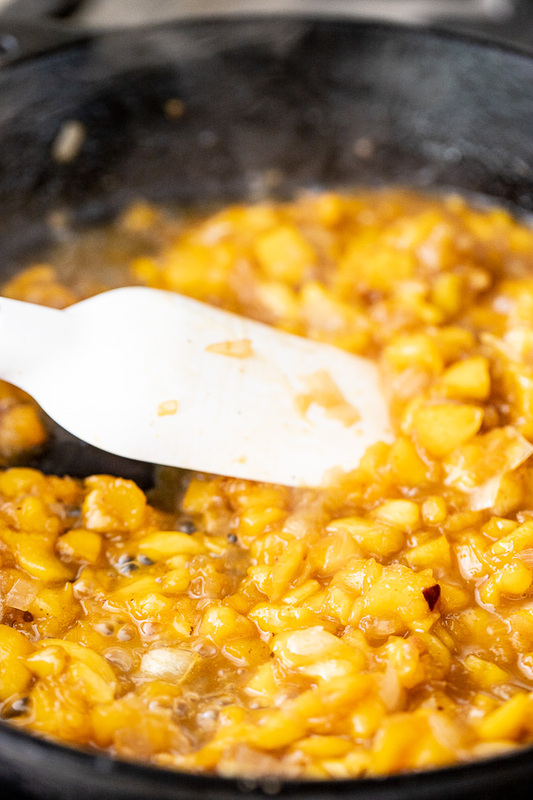 Remove from the oven and serve with the Whiskey Peach Chutney. 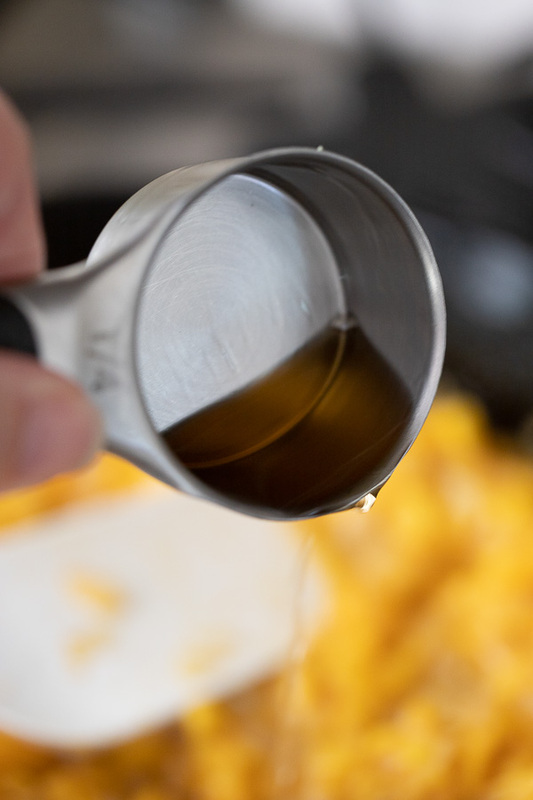 Pour off all but 1 Tablespoon of the bacon fat. Over medium high heat, add the onions and saute until just becoming translucent. Add the peaches and cook for another 3 - 5 minutes until the peaches start breaking down. Add the whiskey, stir and cook for another 2 - 3 minutes. Add the maple syrup, brown sugar, cayenne and salt. Stir. Continue cooking for another 5 minutes until the mixture is thick and almost jam like. Cool. If not using right away, refrigerate in a covered container. Chutney will keep for 3 to 5 days. For the shrimp: I used a 25 count (that's 25 shrimp per pound) size for this recipe and found that the shrimp weren't overcooked by the time the bacon was cooked. Bacon: look for thinner versus thicker strips of bacon. Thick cut or artisanal bacon is too thick - the shrimp will be overcooked before the bacon is done. 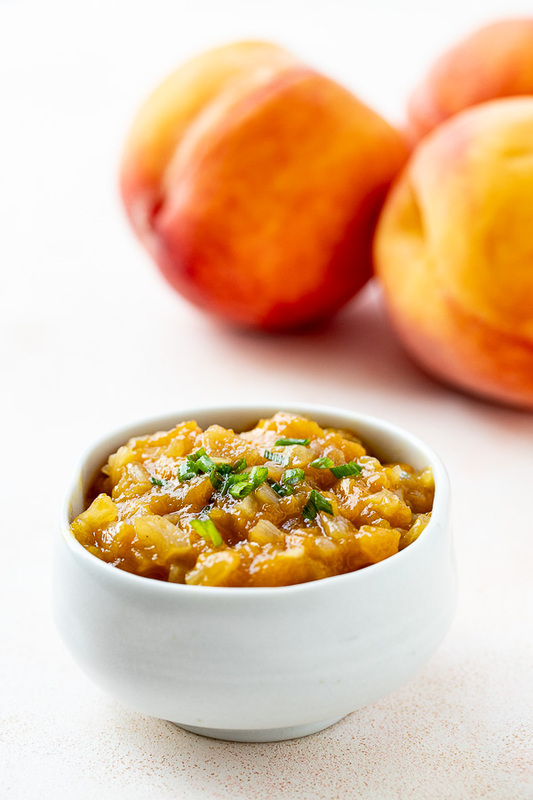 this Whiskey Peach Chutney is a great way to use up overly ripe peaches. If your peaches are super sweet, I would start with half the maple syrup and sugar called for in the recipe. If the chutney needs to be sweeter, you can always add a bit more brown sugar and/or maple syrup. If you don't have maple syrup, you could use all brown sugar. I like the maple syrup for both the flavor and for the silky texture it gives to the chutney. I used Jack Daniels Bourbon Whiskey in this but any decent quality bourbon would work - Elijah Craig and Woodford Reserve would both be great options. You can assemble the bacon wrapped shrimp several hours before you are going to cook them. The whiskey peach chutney can be made 2 or 3 days ahead of time. Let the chutney come to room temperature before serving. You had me at bacon. But whiskey peach chutney?! Amazing. Thanks for a great recipe! Nancy these bacon wrapped shrimp are fantastic! I especially love the tips on brining the shrimp – so awesome! Brining shrimp is definitely a game changer!!! Nancy, this looks seriously amazing! I’ve never brined shrimp before using it and I’m so excited to try it! And that chutney made with my absolute favorite tropical fruit! YUM! Hi Valentina – the brining method is amazing – shrimp comes out so tender and juicy!!! So glad you enjoyed this post!! !